Summer is here! Well, sort of. It's come and gone very quickly in London, bringing with it a whole lot of happenings that has distracted us from this blog. I've been spending most of this summer in excitement over the recent news of going to Singapore next year, which means this blog will most certainly become dedicated to hawker centers next year...mmmmmm! Along with that, I've been a bit crazed from learning hundreds of Chinese characters (frequently whilst balancing in the sauna-like tube during rush hour) and most importantly.......eating a lot but not blogging about it. Fail. Back in July, we spent Matt's birthday weekend in a city that we really felt like deserved a second chance. Paris. The first time we went to Paris, it was December. Enough said. This time, it was beautiful summer. That's right, it turns out that being snubbed by Parisians it is far more enjoyable when the sun is shining. It is also infinitely more enjoyable when priorities are set around wine and cheese rather than running around being a tourist. For a nice dinner, we went to Le Chateaubriand for the much anticipated tasting menu. I called about 2 weeks in advance (the earliest they take reservations) and got a 7:45 seating. Having recently made the Worlds 50 Best List, I really love how unpretentious the restaurant is. I also take amusement when some people miss the memo on the atmosphere and show up in fancy dress. The set menu is officially 5 courses but there are extra nibbles here and there that make it seem more. We also opted to do the tasting blind without knowledge of the menu, which we wouldn't have been able to read anyways. The meal started off with a couple of warm cheese puffs. 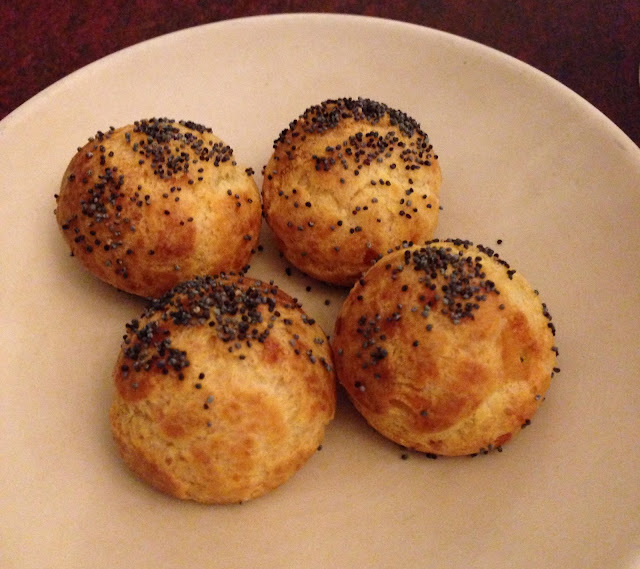 Now I could try to describe these with words such as "buttery" and "flaky", but at the end of the day, we are talking about cheese balls. They were superb. Next came 2 little shots of cold ceviche in juice, which went down easy and cleansed the palate for what followed next. Little fried baby prawns sprinkled with what tasted like lemon salt. Thoroughly addicting. After this came a whirlwind of other small plates. 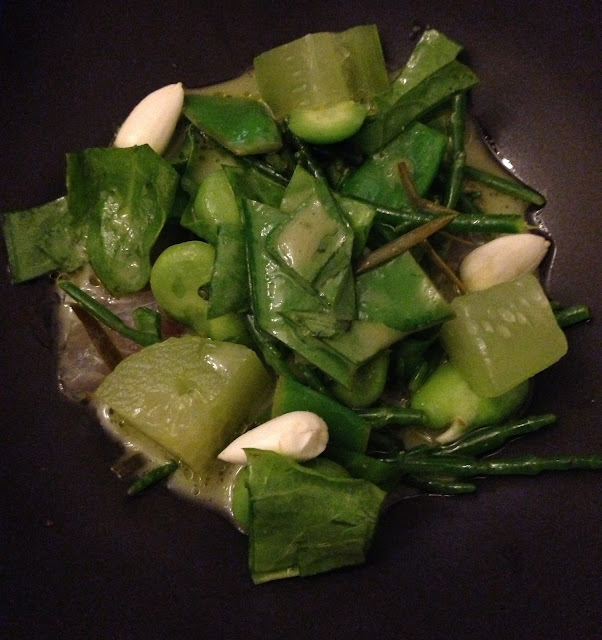 First, a salad of pickled cucumbers, snow peas, broad beans and almonds. I enjoyed the crunchy texture and the refreshing citrusy (is that a word?) flavors. There was another cold dish of shredded crab and grapefruit, which was an interesting combination and definitely not for grapefruit haters (ahem, Matt). It's creative but didn't wow me in taste. After several rounds of cold dishes, I was really ready for a hot main course. Next came a fish with some a purple seaweed. Or was it cabbage? I'm really not sure. This was kind of a disappointment though because the fish was tough and the dish overall lacked flavor and punch. Then came a meat course of veal and aubergine, with apparently lots of seeds. The meat was tender and the aubergine was silky soft, but again the flavors were bland. Not terribly exciting in general. After a quick consume, which had a coffee bean in it (? ), we were on to desserts. I chose the sweet and Matt chose the cheeseboard. The cheeseboard definitely won, and we learned quickly that in Paris, the cheese always wins. It was a good meal overall and an absolute steal for the price. But is it really the 15th best restaurant in the world? Not in my opinion. We were there on a Sunday night, which meant it took much dedicated investigation to find a good restaurant that was actually open. I stumbled on Fish La Boissonnerie on a few blogs and, after seeing how close it was to our Airbnb flat, decided to make a reservation. We arrived at 8pm and the tiny restaurant and wine bar was lively and full. The three course menu is EUR 35 each, which is pretty good considering the amount and quality of food. 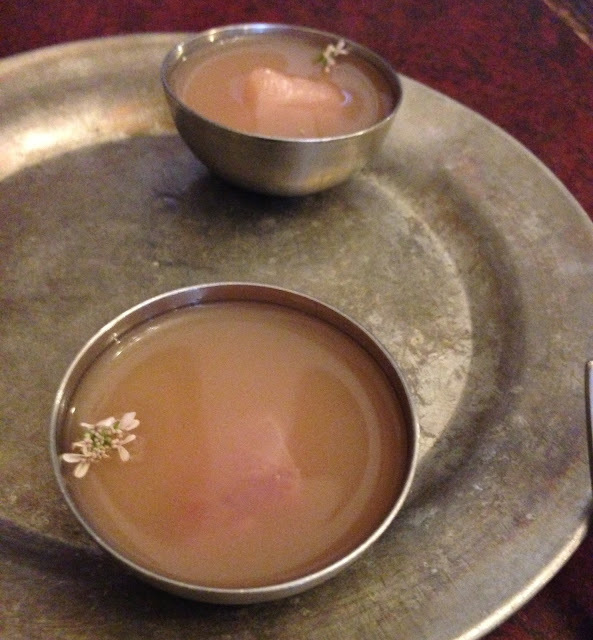 The amuse bouche was a small shot of smooth cucumber gazpacho. It tasted like Chinese cucumber salad, which is one of my favorite things on a summer day. It's fresh, sweet, and fragrant from the sesame oil. Maybe there is some kind of grapefruit revolution going on, because the first starter was a salad of salmon and grapefruit. Again it was good, but didn't wow me. Maybe I only enjoy grapefruit as is, not so much as an ingredient. The other starter was beautiful razor claims with olive oil. It's a rather simple dish but cooked really well. There were even these cute edible flowers, which made me feel pretty girly. The first entree was a grilled loin of tender pork served with cous cous and peppers. The Moroccan flavors in this dish were far tastier than any cous cous I've had in Morocco. The second entree was a pan fried fillet of pollock with roasted baby potatoes and marinated cucumbers. This fish was much better than the previous night's. It was tender and flaky with very crispy skin. The shaved cucumbers were slightly pickled and paired very well with the fish. For desserts, I once again opted for the sweet and Matt got the cheese board. The dessert was a dark cherry chocolate grenache, pitted cherries and vanilla ice cream. It was like a dark cherry ice cream that I loved so much as a kid but wayyyyy better. But despite that... the cheeseboard still won. What I liked about Fish La Boissonnerie is that the food does not try to be overly creative or different, instead it focuses on executing what we're already familiar with very very well. When spent some time walking around Montmartre (actually we walked there from the Latin Quarter) and stopped for lunch at Lui Linsolent, which was very strongly recommended by a friend. We got the 2 course lunch menu. Firstly, there was an aaaaaamazing fillet of sole with grilled pineapple and rice. While it doesn't look impressive, this was one of the best things I had over the whole weekend. The sauce tasted reminiscent of a thai coconut curry that was sweet from the pineapple. Halfway eating it, I realized this magic sauce likely consisted of a pound of brown butter. Matt ordered a very generous portion of beef tartar. While he drooled over it, I am not a big fan of beef tartar in general, so can only say that I did not mind it in small bites. I don't know, somehow I haven't gotten into eating raw meat. I love raw seafood, but raw meat is usually too chewy and I can't help but kind of feel like a... lion... or...cannibal. Indeed it's very good I'm not French. What I prefer is salmon tartar. Although this wasn't anything amazing (and think I make a better version) I always enjoy the combination, especially with good french bread. Oh and there were wasabi potato chips, which is a new and delicious potato chip flavor.